A giant impact between the proto-Earth and a Mars-sized impactor named Theia is the best current theory for the formation of the Moon. 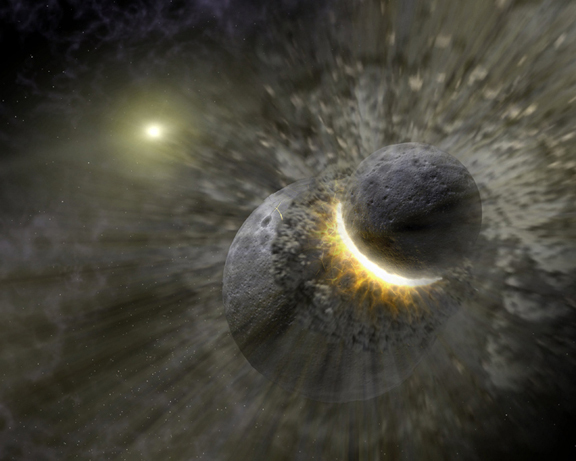 Scientists believe that Theia collided with the early Earth and that the Moon was created from the rubble left over from the collision. Researchers have estimated that more than 40% of the Moon-forming debris should have been derived from left over pieces of Theia, but new research by a team of geochemists led by Junjun Zhang at the University of Chicago suggests that the Moon is made mostly of material from early Earth instead. 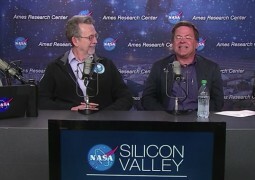 The team analyzed Oxygen isotopes and found that terrestrial and lunar samples were almost identical, which is inconsistent with earlier models. The researchers measured ratios in lunar samples measured by mass spectrometry. 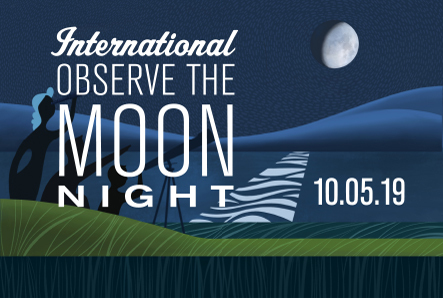 After correcting for secondary effects associated with cosmic-ray exposure at the lunar surface, they found that the ratio of the Moon is identical to that of the Earth within about four parts per million, which is only 1/150 of the isotopic range documented in meteorites. The isotopic homogeneity of this highly refractory element suggests that lunar material was derived from the proto-Earth mantle, an origin that could be explained by efficient impact ejection, by an exchange of material between the Earth’s magma ocean and the proto-lunar disk, or by fission from a rapidly rotating post-impact Earth. However, it remains uncertain whether more refractory elements, such as titanium, show the same degree of isotope homogeneity as oxygen in the Earth–Moon system. Scientists still believe the general idea of having an impact forming disk that coalesced into the Moon is probably right, but this paper shows that scientists still don’t fully understand exactly what the mechanisms were. There is a lot of exciting research still to be done in this field! The paper was published in the March 25th issue of the journal Nature Geoscience.